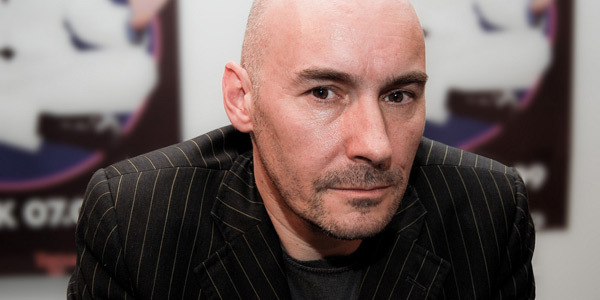 Grant Morrison Reinvents Superman, Can He Rescue DC Comics? An exclusive page from the DC Comics reboot of Action Comics shows a more human Superman as envisioned by veteran auteur Grant Morrison. It’s the most iconic title in the DC Comics canon. When the original Action Comics #1 debuted in 1938, it featured the first appearance of Superman and is regarded as the first superhero comic. It’s also the most expensive–last year, #1 commanded $1 million on the auction block. On Sept. 7, DC Comics will launch the revamped Action Comics, written by veteran comics auteur Grant Morrison–hot off his lauded new book, Supergods. Morrison has the superhuman task of reinventing one of the comic world’s–and popular culture’s–biggest characters for the 21st century, and, in the process, trying to write a new chapter for the struggling comic book publishing industry. The exclusive page 18 panel shown above is the first major shot of the Man of Steel transitioning to alter ego Clark Kent–sans his trademark horn-rimmed glasses–after thwarting trouble in Metropolis. Superman’s fighting crime, of course, but the authorities are suspicious of his powers. He’s misunderstood. He’s different. The Action Comics overhaul is part of DC’s 52-title, issue 1, day-and-date publishing reboot that kicks off Aug. 31 with Justice League by writer/DC Entertainment Chief Creative Officer Geoff Johns and artist/DC Comics Co-Publisher Jim Lee. The remaining titles will be released throughout September as a way to combat an overall trend in waning comic book sales and attract a new generation of readers through modernized characters and storylines. 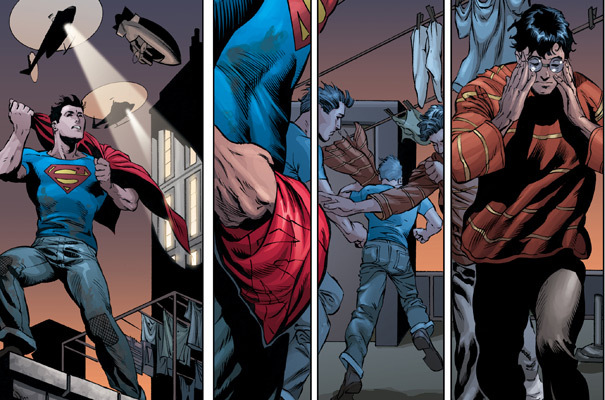 The first six issues of the new Action Comics delve into the origin and evolution of Superman’s costume from a makeshift blue jeans and “S-emblem” T-shirt to the blue bodysuit, redesigned by Jim Lee and the source of much fanboy hand-wringing. 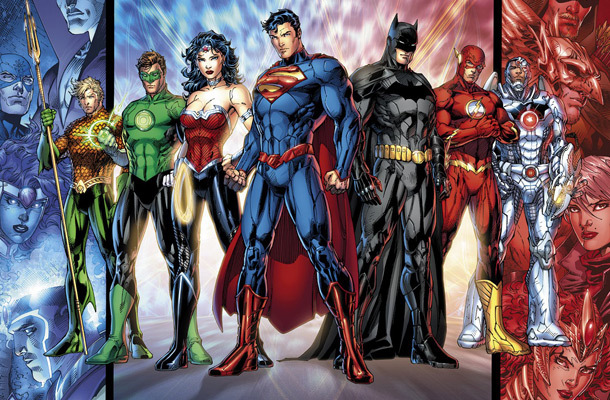 For all of his current enthusiasm, Morrison was initially apprehensive about taking on the assignment when DC Comics Co-Publisher Dan DiDio called at the beginning of this year. Just as the first Action Comics premiered against the backdrop of the Great Depression, imminent technological advancements like television, and the rise of Nazi Germany, Morrison wanted to tap the zeitgeist of current economic and global turbulence, as well as infuse his foreigner’s perspective of America to into Clark Kent’s alien acclimation to humans. Serendipitously, Morrison’s work on his memoir/cultural history of superheroes, Supergods: What Masked Vigilantes, Miraculous Mutants, and a Sun God from Smallville Can Teach Us About Being Human (Spiegel & Grau), helped codify Morrison’s thoughts on Superman.